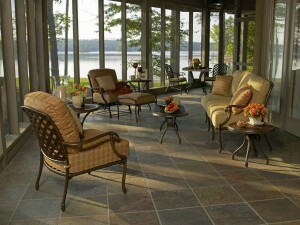 Furniture options for outdoor rooms are continually being updated and expanded. One of my favorites is the double chaise lounge that has separate backs for flexibility so that one person can be sitting and the other lying down. Sophisticated choices in outdoor furnishings and accessories have transformed the design of exterior spaces to a level that rivals the refinement of a well appointed interior. The limitations of outdoor furnishings of the past have given way to new offerings in wrought and cast aluminum, synthetic wicker, teak, and other sustainably harvested natural woods. Twig furniture lends a country and rustic feeling to a scene. As is always the case, the styles you choose will greatly impact the character of the completed design. 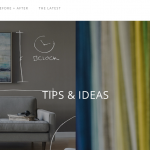 Furniture and fabrics have been re-engineered for durability and colorfastness. Exterior rugs now virtually mimic their interior counterparts, and offer a new element in exterior design. The use of color and pattern for visual pop, coordinating seasonal plantings and containers, the addition of statuary or sculpture, the drama of billowing draperies- all of these elements add to the excitement and endless possibilities for creating an outdoor room. Let your imagination roam! 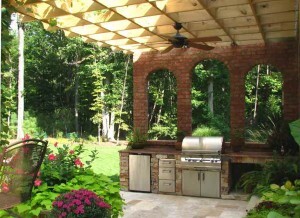 Al fresco kitchens can be outfitted with components that raise the bar for outdoor cooking and entertaining. Infrared grilling systems, power burners, built-in refrigerators, sinks, and storage units offer flexibility in configuration and functionality. These pre-fab units are integrated into kitchens constructed of masonry low walls faced with natural stone, faux stone, brick, or wood. I always recommend investing in top quality appliances if you are building in because replacements can cause a significant redo of the area. When considering the layout for your outdoor kitchen and if budget permits, think about combining the kitchen with architectural features such as a fireplace, overhead canopy, or a built-in bar. These integrated designs create high-styled solutions with substance and beautiful functionality. If a full outdoor kitchen is not on your radar or does not fall within your budget, there are some design solutions that integrate a freestanding grill into your outdoor scene without sending your project over the top. If you have low walls, consider building a niche in which to house your grill. Size it appropriately so as to accommodate your existing grill (or an average size grill). That way, should you choose to replace your grill in the future it’s not a redo of your configuration. Stainless steel or decay resistant woods such as teak cabinetry are an option for freestanding cooking stations. Countertops may be of natural stone, solid surface materials, granite, or concrete, and should be chosen for durability and to coordinate and complement your other outdoor features and style. Our outdoor spaces and rooms come alive when we join the scene. These spaces are created and intended, after all, to allow us to gain full enjoyment of all our surroundings, and to support and enhance our lifestyles. They are a backdrop for our lives. Our outdoor rooms draw us to the fresh air, become the setting for celebrations, and provide us with peaceful havens for retreat. Their meaning becomes special in the context of the memories created. As our attention is drawn to ecology and global health, we all have a unique opportunity to integrate our use of resources with balance and responsibility. With the creation and use of beautiful, functional, and ecologically sensible outdoor rooms, we enhance our lives while strengthening our appreciation of and connection with nature.